Baingan pakora is a crispy fried indulging snack made mainly with chickpea flour(besan) and eggplant(baingan). It can be prepared in minutes without much hassle. Its name varies from region to region. Such as ‘baingan bhaji’ in Hindi, ‘beguni’ in Bengali and ‘baigani’ in Odia. It makes a great meal with simple rice and dal. Besan or chickpea flour is an essential ingredient in Indian cooking. It is naturally gluten-free and also a very good source of protein. Whether you are vegan, vegetarian or nonvegetarian, It simply adds great flavor and texture to any dish. 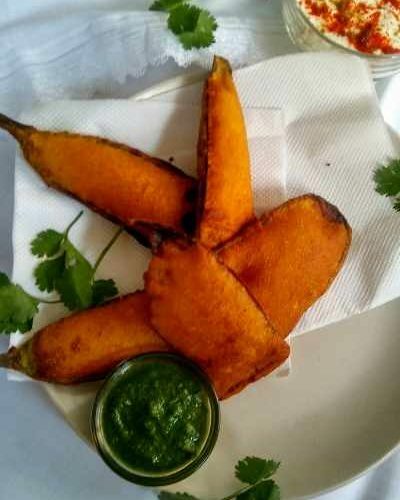 To make this baingan pakora you need a very few ingredients. Choosing the right eggplant is the key. I would suggest going for the purple, lightweight, smooth and seedless ones. Though its a personal choice but I always prefer the long varieties. Here I have used a hip tablespoon of rice flour to make the pakora crispy. Also to enhance the flavor and taste of the baingan a pinch of sugar has been added. Adjust the amount of chili powder as per your taste bud. 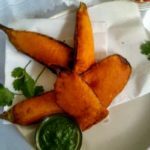 This baingan pakora recipe is best enjoyed when pairing with a cup of hot masala tea or just serve this with some green chutney or tomato ketchup. Let me know your thoughts about this eggplant fritters recipe in the comment section. Also, you can connect with me on Instagram, Facebook, Pinterest, and Twitter. 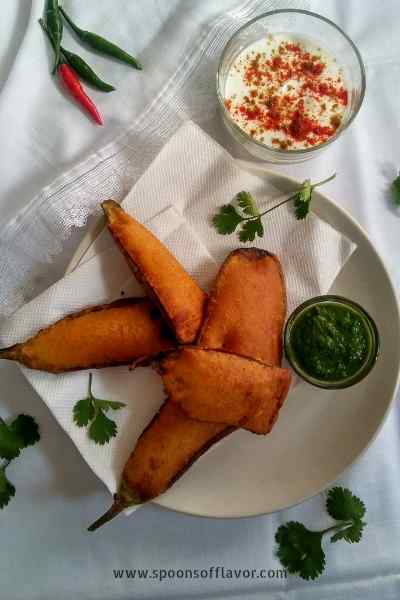 Baingan pakora is a crispy fried indulging snack made mainly with chickpea flour(besan) and eggplant(baingan). It can be prepared in minutes without much hassle. Combine gram flour, rice flour, turmeric powder, red chili powder and salt well in a mixing bowl. Then sift the flour mixture through a strainer. Gradually add water and whisk until you get a lump free smooth batter. Then set aside. Cut the eggplants in thin slices(approx 3 mm). Rub salt and sugar well and spread them on a plate and keep aside for 15 minutes or until the total moisture comes out. Once done dab them with a cloth to drain excess moisture. Heat oil in a pan and allow it completely hot. Once the oil turns smoking hot reduce the flame to medium. Then dip one eggplant slice in the batter shake to drip excess batter then add in the hot oil. Wait for 3 seconds then turn to the other side and deep fry in the hot oil until both sides turn golden crisp. Once done remove them from oil and place them on kitchen towel to drain out excess oil. Follow the same process and deep fry all the brinjal slices. Baingan Pakora is ready to serve. Sprinkle some black salt and serve hot. 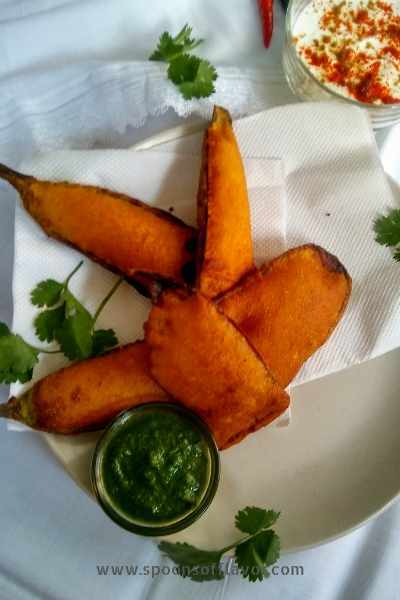 Crispy pakoda here Geetanjali. Loving the perfect batter mix with the chick pea flour here. Crispy pakoras with masala chai is simply irresistible Geetanjali ! You are tempting me to try this dish. I love most pakoras but onion and brinjal pakoras are my fav ! these have turned out so well, Geetanjali ! My nani used to make super tasty baigan ke pakore. Loved your recipe and pakore look so crispy and yumm. The Pakoras look so perfect and so crispy. This weather is so apt for pakodas and some adrak wali chai. Pakoras with eggplant taste good but I have somehow never made it at home. Need to make it now.